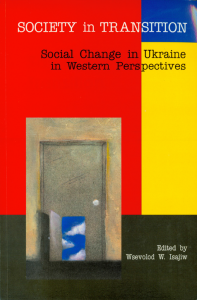 SOCIETY IN TRANSITION: SOCIAL CHANGE IN UKRAINE IN WESTERN PERSPECTIVES. The essays in this volume focus on the transition of Ukraine from Soviet Ukraine to independence. The chapters are organized according to the following four basic processes that make up the transitology model: transition to a free-market economy; transition to a democracy based on civil society; development of social trust, and development of culture that articulates civil society’s basic values and norms. Also volume includes a focus on religion as a factor in political transition and social transition of Ukraine. This has not been a usual feature of transitology literature, yet religion potentially plays a significant role in the creation of civil society.